The picture of Flower and the weeping young girl has caused many Vietnamese citizens to call for a ban on the consumption of dog meat, recent polls show that nearly two million Chinese citizens are in favor of legislation banning the sale and consumption of dog meat, and in the last month Korea’s largest dog meat restaurant shuttered its doors for good under mounting pressure from activists across the globe. 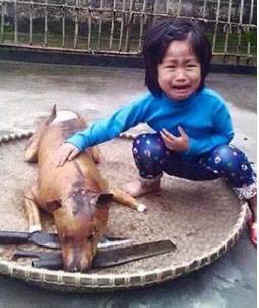 Last week, the picture of the mysterious unnamed Vietnamese girl seen sobbing and tearful next to the body of a dead dog, cooked, and prepared for sale at one of Vietnam’s open air dog meat markets broke the collective heart of the internet. Now, more details have emerged and the story has somehow become even more heart wrenching and further illustrates the agony and torment of this vile trade. According to the People’s Daily Online, the dog pictured was a family companion whom the unidentified little girl had named Flower. After the beloved dog had been missing for several days, family members began searching for Flower and it was when they wandered past a local dog meat stall that the grief stricken little girl recognized the remains of who had once been her cherished companion. Demand for dog meat continues incessantly in many Asian countries like Vietnam, China, and Korea. As was the case with Flower, countless dogs are stolen at night from the porches and gardens that are their homes and they wind up on the butchers block still wearing the collars that were around their necks when they were taken. The story of Flower and the little girl that cared for her so much is sorrowful, regrettable, and tragic. But it also represents a tipping point, that moment in time when the world takes notice and decides to stand for what is right. The picture of Flower and the weeping young girl has caused many Vietnamese citizens to call for a ban on the consumption of dog meat, recent polls show that nearly two million Chinese citizens are in favor of legislation banning the sale and consumption of dog meat, and in the last month Korea’s largest dog meat restaurant shuttered its doors for good under mounting pressure from activists across the globe. Cultural change is coming, change made manifest by one small sad little girls weeping, mournful face.